How can the Magnetic Laundry System Clean your Clothes with Just Water? The Magnetic Laundry System is completely unlike anything you have seen or heard about before. The Laundry System was designed and engineered to give you many, many years of service, and save you thousands of dollars on not buying laundry detergents. In the process, you will be preventing thousands of pounds of chemicals from being dumped into our water supply and from being imbued in your garments, which may create a dramatically positive effect on your family’s health if eliminated. We don't even like to refer to them as laundry balls because this is such a unique process and technology. This is a twice-patented technology based upon harnessing permanent magnetic force to assist the washing process. 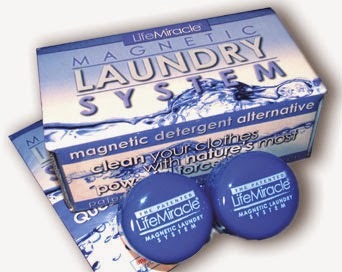 The Magnetic Laundry System is NOT a "laundry balls"
The "laundry ball" products you may have heard of are typically little chemical pellets in a vented, round plastic sphere. These chemical pellets are used up after a number of washes, and then need to be refilled. It is still a little better than detergent from an environmental standpoint, but the process remains a chemical one (very similar to detergents) and is not the same as our patented magnetic process. You need to know that you are not washing your clothes with soaps, and you probably never have in your lifetime. Detergents are actually not soaps. They are predominantly petrochemicals derived from crude oil. Water is the universal solvent. Water is what ultimately cleans your clothes whether you use laundry detergents, or the Magnetic Laundry System. All these products do is help water to clean better. We do it on a chemical-free, completely renewable magnetic basis, while they do it using non-renewable petrochemicals. Magnetic force is one of the most powerful natural forces on earth. In fact, the earth itself is like a giant magnet with a north and south pole. It is an amazing source of natural energy. Even the weak magnets on your refrigerator defy the powerful force of gravity without batteries or being plugged into any power source. We are simply harnessing that amazing force and focusing it in your home washing machine to affect the water. At an atomic level, everything is affected by magnetics. All you need to do it try is for yourself and see the results with your own eyes. Detergents are chemical surfactant petrochemicals derived from crude oil. The basic building blocks for surfactants, with a few exceptions, are derived from crude oil. Unless detergent companies choose to cut their profit margins to keep the cost of detergent down, you will be paying more and more for your detergent just as you are paying more and more to fuel your car. As the raw material cost for detergent escalates, so will the detergent cost to the end users. In addition to that, their plastic containers (which are made from only 25% post consumer recycled plastic) are made from petrochemicals, and it costs more to ship these bulky and heavy bottles because of record-high fuel prices. These additional costs end up being paid for by the end user as well. Using the Laundry System instead of detergents is preventing petrochemicals from getting dumped into our fresh water supplies, helping to preserve our most valuable natural resource critical for human survival. Less than 1% of the world's water supply is considered drinkable, and preserving the quality of this irreplaceable resource is paramount for human, animal and vegetative life. Furthermore, bypassing the rinse cycle can save massive additional water usage (20-40 gallons of fresh water per load), electricity (derived mostly from burning coal and oil which are big pollutants), natural gas (for heating the extra water) and sewage. It also may possibly help reduce the causes of global warming--since such a massive amount of detergents are made and used around the world, significant resources (fossil fuels) are used in its manufacturing and delivery. How will Your Clothes Smell Like with the Laundry System? They use detergents, spot removers and bleach with perfumes in their washing machine, then they use fabric softeners and/or dryer sheets in the dryer which add even more perfumes. Then they wash their bodies with scented soaps and shampoos, and towel off with their scented towel (after they slept all night in perfumed sheets and pillowcases). Then after all of that, they apply perfumed deodorant and spray on their favorite cologne. This is simply too many chemicals on the body, and sometimes the body may rebel with rashes, respiratory issues or illness. If you absolutely cannot live without a scent on your clothes, then just use one scented dryer sheet. There is simply no reason to pile all of the other scented chemicals on your clothes. And you need to know that most of these may be unhealthy for your skin and respiratory system, so the less you use, the better off you probably are -- especially if you are chemically sensitive. Some of those red eyes, rashes and runny noses are not because of allergies, but due to the perfume and petrochemicals left behind in your clothes. There are a variety of washing machines from front loaders to top loaders, and interior washing drums ranging across plastic, iron and stainless steel. The Magnetic Laundry System works with all of them. The laundry units just need to be submerged and/or in close proximity to the water for maximum effectiveness. The Laundry System units absolutely do not have to "stick" to the water drum to work properly. The material the water drum is made of makes no difference, the Laundry System works in all of them. The units may end up "sticking" to each other in the washing process. This is perfectly normal and will not diminish their effectiveness because they still are emitting the same level of magnetic force whether they are attracted together or not. If you or your family suffers from chemical related sensitivities like skin problems and/or respiratory issues, you owe it to your health to switch to our non-chemical alternative product. From a financial standpoint, you should be able to save hundreds of dollars a year on detergents, and even more if you bypass the rinse cycle since you would not need it any longer (which would also save 20 to 40 gallons of water per cycle, a significant amount of our natural resources). You will save time, reduce your effort with your laundry and avoid lugging a 15 lb tub of detergent from the store every time you buy it. Your wardrobe (which is a considerable investment) may last a lot longer because of the reduction of harsh chemicals. It makes your home more “green” and also more child friendly by reducing the amount of toxins in the home. It may have a massive impact on the environment by less chemical dumping and reducing our dependence on foreign petrochemicals (Yes, your detergents are petrochemicals derived from crude oil as we explained above). Please Note: The Laundry System is designed for use in domestic (home) size washing machines only. They cannot be used in commercial sized washers. You don't need to order more than one kit. One kit is perfectly sufficient for a home washing machine. However, you can get one for home and one for travel, or if you want to give one as a gift. Once people use this product, many people become evangelists telling others about it. The laundry system kit comes with a 30-day money back guarantee and a LIFETIME WARRANTY which makes them totally risk-free for you to try! Order your laundry system package today!